I cringed this morning when I was asked about this, last time I had to get a client to authenticate to a domain through a firewall, it was ‘entertaining’. The problem is Windows loves to use RPC, which likes to use random ports, so to make it work you either had to open TCP ports 49152 and 65535 (Yes I’m Serious). Or you had to registry hack all your domain controllers and specify individual ports for RPC as per MS KB 224196, then allow those ports. I have a client that’s got a separate domain in their DMZ and I need to setup a trust with their internal domain, so I started writing the firewall config. Then when I asked the ‘Do you want to open all these ports or simply lock RPC down on all the domain controllers?’ Question, my colleague found ‘dcerpc’ inspection. DCERPC is a protocol widely used by Microsoft distributed client and server applications that allows software clients to execute programs on a server remotely. 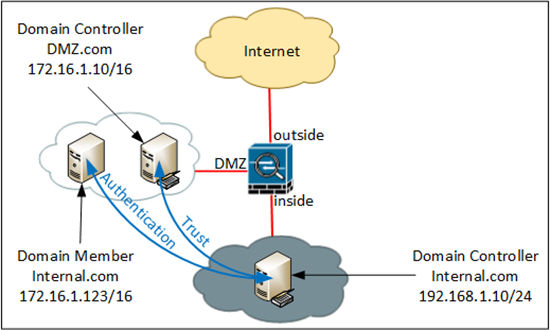 Note: Setting up a ‘Trust’ or allowing a client to ‘Authenticate’ requires the same configuration, but below I will use the IP of the Domain controller, rather than the IP of the client. I’m assuming you ALREADY have access-lists from your internal network, and from your DMZ, you may need to replace the names of the ACL’s I use below with your own, ‘show run access-group’ will tell you. TCP 135 For The Microsoft Endpoint Mapper. TCP 464 For Kerberos Password Change. UDP 464 For Kerberos Password Change. TCP 636 For LDAPS (Secure LDAP). TCP 3268 For LDAP (Global Catalog). TCP 3269 For LDAP (Global Catalog Secure). So connect to the ASA, Go to enable mode, then global configuration mode, and add the ACL’s to open the ports above. BE AWARE the last line enables ICMP/ping (just for testing you can remove it later and you will need to have ICMP inspection on for it to work). 2. Then we need to allow the traffic from the other direction, again here my ACL is called ‘DMZ’, check and change yours accordingly. 3. Now create a class-map and set it to inspect TCP port 135. 4. Then create a policy-map to use that class map to perform dcerpc inspection. 5. Finally apply the policy-map to the interfaces with a service-policy. 6. Give it a test, make sure the machines can ping each other, and you may at this point want to remove the ICMP lines from the ACL. Once you are happy, save the changes.